“How would a kid draw a house?” architect Per Franson asked himself when designing the Olivero-Reinius family home in suburban Stockholm. The simple prefab structure’s unusual color comes from a traditional source: falu rödfärg, the historic mineral paint that gives the region’s famous barns their red color. Here, the addition of a tint created a hue that matched the house’s green Plannja roof panels. A double-height corridor runs the length of the house, and a slatted wall on the second floor overlooks the space. In the master bedroom, a Hästens bed is atop a Mats Broberg & Johan Ridderstråle rug. Franson Wreland also designed the court-yard and a pair of 160-square-foot outbuildings—one is used as guest quarters and the other as storage space. 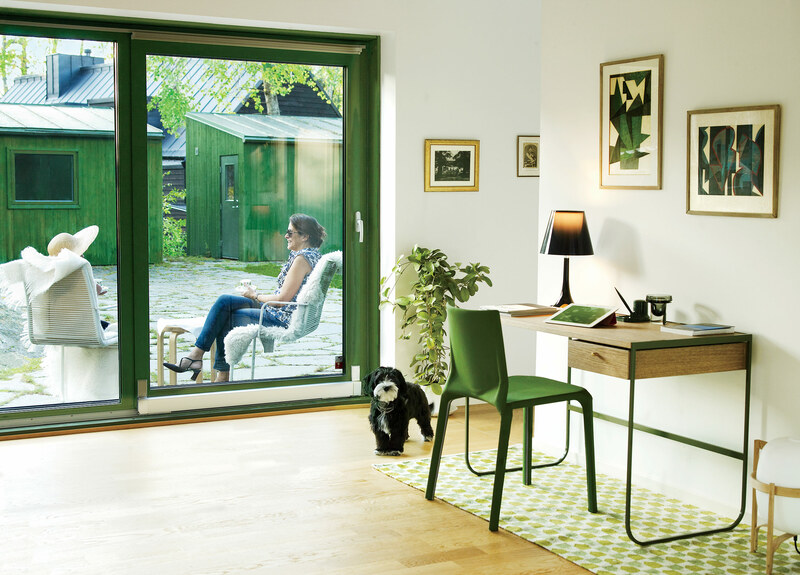 While residents Julia and Fatima Olivero-Reinius chat outdoors, Chippie the dog approaches an Asplund desk and a chair by LucidiPevere. Outside, Kartell Masters chairs surround a Tom Dixon Screw table. In the dining area, Splügen Bräu pendant lamps for Flos hang over a Super-Elliptical table by Piet Hein and Bruno Mathsson for Fritz Hansen. The second floor holds three bedrooms and a living area for the girls. Here, Paula, 11, and Sofia, 9, hang out near an IKEA PS 2012 sofa by Nike Karlsson. The slatted wall at left allows a view to the downstairs. Zebra-print cushion covers from H&M Home and a pair of tables by Patricia Urquiola for B&B Italia provide a colorful counterpoint to the neutral palette of the living area’s B&B Italia sofa and Pernilla 69 armchairs by Bruno Mathsson for Dux. A Lotta Döbling painting from Domeij Gallery hangs on the wall. Upstairs, each daughter’s bedroom was designed as a sanctuary, with cozy touches like Simon Key Bertman quilts and cushions. The bed and Pile bedside table by Jessica Signell Knutsson sit on top of a Carpet Honeycomb by designer Maria Löw. The master bedroom opens onto the backyard. “The view is beautiful year-round,” Fatima says. Six-inch-square blue tiles cover the walls and floor of the girls’ upstairs bathroom. The towels and rug are also by H&M Home. Building a house is a journey filled with unforeseeable variables. When traditional hiccups like late shipments and permit delays are compounded by a harsh Swedish winter, the challenges may seem almost insurmountable. On Lidingö, an island in the suburbs of Stockholm, one architect found a way to cut time—and costs—thanks to a tip from his contractor. When Per Franson was tasked with building a minimalist family home for Fatima Olivero-Reinius, a Web designer, and her husband, Johan, an advertising executive, he wasn’t expecting to sidestep the usual challenges of construction. But builder Michael Johansson offered a novel solution: He and his team of carpenters would build the structure in a hangar-like space in Johansson’s hometown of Kalmar, some 260 miles from the building site. At first, Franson and his business partner, Mattias Wreland, weren’t sure. They had built a house with prefab components before, but this project would be the first time they’d be designing one with the intention of building off-site from the very beginning. Eventually, Johansson swayed the architects with the benefits of using his own team on his own turf. The decision to build in Kalmar wasn’t just a matter of convenience. The small city is located in southeastern Sweden in the region of Småland, where both Franson and Wreland—who has since shifted his primary focus to furniture-making—were raised. It’s an area steeped in craftsmanship, with a wealth of small factories, carpenters, and builders, and its influence extends to the heart of the architects’ practice. The residents were open to the solution. They knew they wanted a modern house that connected them to nature without being a glass box, and a design that complemented a nearby home by the well-known Swedish architect Thomas Sandell. The other requirements were simple: a kitchen to serve as a gathering place, a master bedroom for the parents, and three identical bedrooms for their growing daughters, Julia, Paula, and Sofia, now 13, 11, and 9. Among the challenges Franson and Wreland faced were local building restrictions that limited the scale of the house to one and a half stories. Taking a cue from the historic structures around it, they imagined the house like a barn and a hayloft. Communal areas and the master bedroom comprise the first floor; the girls’ bedrooms, bathroom, and living room take up the second. Open sight lines from top to bottom connect the two spaces, while grown-ups and kids have plenty of space for themselves. Further restrictions, which limited the size of outbuildings to 15 square meters (160 square feet), led to the creation of two matching structures, a storage space and a guest cottage that each max out the square footage the architects could build without needing a permit. With these twin spaces set across a small courtyard that the architects also designed, the result is a small compound that’s complete to itself—the house like a barn, looking out not to the neighbors but over its own stables. The architects ended up with a 50-50 split between off-site and on-site work, building the shell of the house in the hangar and finishing the details on location. 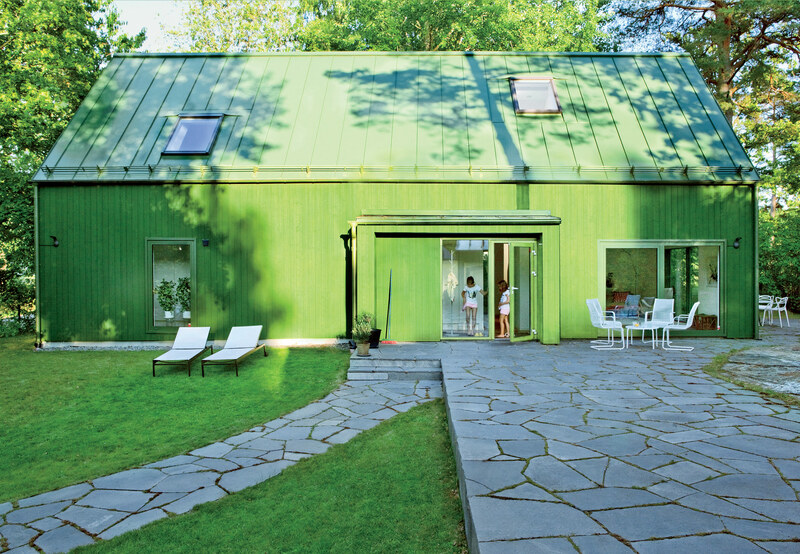 To avoid the telltale seams of modular construction, the exterior pine cladding and Plannja metal roof were installed and painted after the pieces were shipped to Lidingö. All together, the process took about eight months. Creating a prefab program from the very beginning led to surprisingly few compromises. One came in the form of the windows—ordered from Poland and custom painted to match the exterior’s traditional green-tinted falu rödfärg mineral paint—which were lifted from the floor to allow space for a beam underneath to make the panels more stable for transportation. “We didn’t have to rethink too much, actually. It’s a matter of centimeters, plus or minus, to be efficient on that loading truck,” Franson explains. The success of the project has inspired Franson to imagine recreating it for other clients, tweaking the plans, and the color, to suit their individual needs. And thanks to the off-the-shelf solutions the architects chose, it’s easily achievable.